referenced below when it has been recovered. The first task that exists will be to identify the pinyon pine and ponderosa pollen grains which are dominant in the region of rainwater collection, and then to identify the specific species that is common within the samples collected. Those with botanical and microscopy backgrounds are encouraged to participate. No identifying statements have been received since the posting of this inquiry on June 27 2000. My research now indicates that the objects microphotographed are most likely pine pollen grains. CSIRO Atmospheric Research company in Australia has made information available on the internet which appears to be of value with this inquiry. 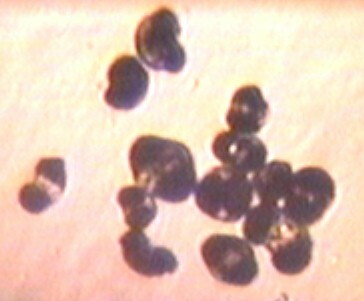 The following photograph and link to their site shows a microphotograph in the lower left of pine pollen which is a match both visually as well as for size. 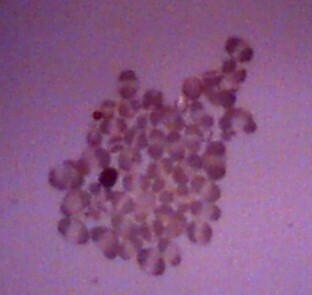 The stated size of the pollen grain shown is 56 microns, I have measured 40-50 microns. Pine is also reasonably common in the Santa Fe region, although Juniper is more common in the actual location of rainwater collection. I will assume no further research on this topic is required unless someone provides information to the contrary to that which I have found. The web page will be maintained but reduced in rank on the website index listing. With the exception of these objects now identified, there is no additional material of unusual interest that I have identified within the two rainwater samples analyzed. Santa Fe NM (El Dorado) received the first substantial rains of the year 2000 on June 26 and 27. 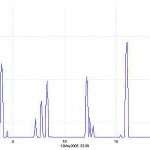 Rainwater samples from these storms have been analyzed under the microscope. The water was collected within a clean cookie sheet on both days separately and placed in separate clean glass jars. Both samples are showing the following structures which I am requesting identification assistance with. 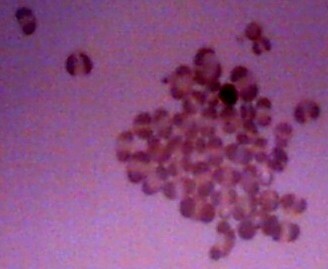 They appear to be a double celled structure; no movement is apparent under the microscope. The cells or objects measure approximately 40-50 microns in diameter. 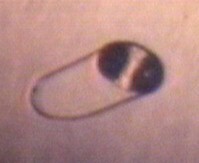 In general, two denser spherical volumes appear to be connected by a less dense material that channels between the end spheres. Magnification of these images is at 200x. Contrast and brightness have been enhanced to further reveal the structure. The cells occur individually as well as within clusters; the former arrangement is more common. Identification from those knowledgeable in microbiology and microscopy, or suggestions for identification of these images would be beneficial. 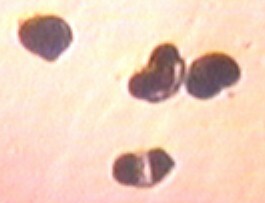 These cells or objects are the primary objects which have been identified within both rain samples, other than what appear to be infrequent fibers and/or debris. Thank you for any assistance on this matter. It would be of much interest if any other readers in other parts of the country are able to duplicate the results shown on this page. Any comments or statements regarding identification of the cells, objects, or structures shown on this page are welcome. 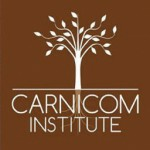 Comments can be posted on the message board attached to www.carnicom.com, or email sent directly to info@carnicominstitute.org. Thank you for any assistance in identification. 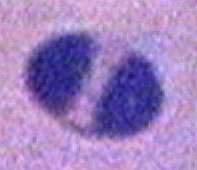 region between two denser masses is seen in the lowest object of this set. Effective Magnification is approx. 500x. and is to be disregarded. separated by a region of more translucent material.